Some years ago I was involved in developing a project in a 'culturally deprived' rural area. The object was to provide an opportunity to explore the relationship between sound and movement. It was to be implemented by a group of local musicians and dance teachers. One thing we were keen to do was free participants from their preconceptions about dance and music. On a movement level this meant exploring responses to sound other than the usual disco clichés. On a sound level we wanted participants, mostly with very limited previous exposure to music-making, to feel they could create a valid soundscape. There was no point giving them instruments like violins, flutes or guitars. These come with large amounts of cultural baggage about how, and how not, to play them; about the sort of sounds they should make. They are intimidating and can stifle creativity. Instead it was decided that we would present them with instruments that would allow for genuine exploration. Odd instruments from around the world that participants were unlikely to have seen played before; that had no obvious right or wrong way of playing; that may even inspire dance and movement just by their appearance and tactile qualities. And, most importantly, provide a level playing field for all. It fell to me to choose the instruments. This all happened just before the turn of the millennium and the dissemination of information was not what it is now. However, a catalogue duly arrived from Knock On Wood in Harrogate http://www.knockonwood.co.uk/ full of exciting looking items from all corners of the globe. Our budget was tight but we managed to procure an enormous ocean drum, a kokiriko, a couple of tongue drums and one or two other things the names of which I've forgotten. Perhaps the biggest hit was the Indonesian angklung (pictured) which took ages to set up but was so different from anything anyone had seen before that it was always worth it. Also popular were the mbira (East African thumb pianos), large and small, that I tuned to a Japanese scale, one an octave higher than the other. A cursory glance at Knock On Wood's online catalogue shows that, while not everything we bought is currently available, there is plenty of new stock to browse. The workshops were, in my opinion, a great success and justified their funding. Of course it's hard to be objective about these things (and there were fewer self-assessment forms to fill in then). What pleased me most about the project was that it encouraged a sonic exploration of objects, from violins to milk bottles, objectively and without prejudice or fear. This is an approach that a classical education encourages all too rarely. 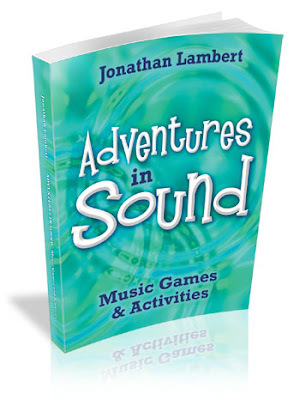 My book, Adventures in Sound, contains a number of games devised with just this purpose in mind and December's free game, Copycat, at playwithsound.com is an example. If you haven't yet visited my website then you really should. There is a free game every month and this month's is called Copycat. It can easily be adapted to a Christmas gathering. Although you can certainly play it with musical instruments, it will provide equal or greater pleasure played with objects you find lying around in the festive debris. Don't get too hung up on the rules or on winning or losing. If everyone is having fun then you're all winning. There are more free music games on the website. 'Tis the season of school concerts again. I realise this post is too late to save you from your fate. However, with the experience fresh in our minds let the campaign to make them less of an ordeal in the future begin here and now. Depending on where you stand – proud relative in the audience or nervous teacher/accompanist in the wings – my guess is you will have found the greater part of the event rather tedious. The children plod through overly long pieces that are technically beyond them and that they don't understand. To all but the doting parent, for whom the child can do no wrong, one such exhibition is forgivable, two wearing and three irritating. An entire evening peppered with such fare takes tedium to a level so deep and trance-like it's almost an out of body experience. Even when interspersed with ensemble pieces and items from the choir of reluctant, but pressed, cherubim, it remains hard to bear, for these items are far too lengthy and drag. Of course there are many factors to juggle. A cast of thousands means bums on seats and that is good for the supported charity or the music department's coffers. And yes, inclusiveness is a good thing; everyone gets a chance to shine. However, there is no need for all six verses of Once in Royal David's City. Nor is it necessary to feature each section of the orchestra in every instrumental. You may call me mean-spirited, or Ebenezer Scrooge for that matter, but believe me: I've paid my dues. As parent and as teacher over many years I've sat through more of these events than I can remember. Keep the bigger picture in mind: When auditioning or rehearsing a piece remember it is only one of many. Avoid solo performances: Unless you have a genius in your ranks these can be tedious. They can also provoke enmity. If you feel someone would benefit from a solo spot, feature them in an ensemble piece. Vary the fare and try not to have two or more similar items unless the overall structure demands it. Allow plenty of time for rehearsal. Stand up to your superiors in demanding this. Make sure they know that time spent practising is directly proportionate to the quality of the event. The event that showcases their school. Bear in mind the demographic of the school and the ethos it is promoting. Nine lessons and carols may go down well in a rural parish but may be unsuited to an inner city area with a broader ethnic mix. Apply quality control. If you really must include a piece you know to be poor or unready, shorten it. This will save embarrassment for both performers and audience. It will also mean the piece improves faster in rehearsal. Choose material suited to the ability and understanding of the students. Otherwise they come across as trained monkeys. Make sure children understand the words they are singing. Is it only me who is nonplussed by 'Lo he ab horse snot the burgeon swoom' in O Come All Ye Faithful? If you feel uncomfortable explaining the meaning of the words they shouldn't be singing them. Edit. Be ruthless. Cut and cut again. Pare it down to the bare essentials and everyone will love you for it. But: make sure everyone is in something. Kids in the show means adults in the hall. Christianity has given rise to a vast amount of wonderful music over the centuries and the tradition continues. Tallis, Handel, Bach, Mozart and Tavener have all turned their hand to it. And there is a host of moving and rousing hymns and carols. Why not get the kids singing some of these? Songwriters in more recent times have had fun with the secular side of Christmas to good effect, often using rock'n'roll as a vehicle. But rock'n'roll is music born of angst and the need to party. When it hit the news in the 50s it was called the Devil's music and it had horns. It can't be sanitised, or have religious lyrics set to it, and then be passed off as a viable alternative to the real thing. Only a brain-dead youth could even pretend to like that. It's the equivalent of Satanists writing pastiches of Barry Manilow tunes. At least, when torturing teenagers, they have the sense to use it in its pure and unadulterated form. Time is the only known cure for adolescent angst. No one can hope to woo the young away from 'the dark side' with Christian rock. The only ones who'll come aren't worth wooing. Can we truly hear something unless we start from a point of silence? Is it necessary to clear the mind of all the expectations we place on sound, and in this case sound organised into music, to respond honestly? To listen without leaping to a judgement? I wrote last time (http://playwithsound.blogspot.com/2008/12/learning-to-listen.html) about the challenges of developing listening skills in children. The fact is that children have fewer pre-conceptions with regard to sound. The older we get, the more we take for granted. A child, on hearing a familiar sound, is far more likely to look for the source of the sound than an adult. They are open-minded (or naïve) enough to make a visual check that the sound corresponds with what they assume to be the cause. An adult will tend to assume that if they hear a familiar sound then it has a familiar source. And no criticism is intended. If we didn't then our concentration spans would shrink to zero. What is interesting about this, however, is that it means that children are more open to the possibility of the sounds they hear emanating from someone or something other than the people and things generating them. Of course we are all open to this possibility. If we weren't then sound effects in the cinema, known as foley, would be rendered ineffective. The sound of a stick of celery being broken takes on a whole new meaning when laid alongside a movie of someone getting their arm fractured. Working backwards, some imaginative soul must at some time have snapped a stick of celery and thought 'this sounds just like a bone being broken'. So here's a game, an experiment really, to play with children or adults. Let's call it Junk Shop as a working title. I'm sure you can adapt it for use at Christmas dinner. Age group: children, teenagers and adults. Aims: to develop listening and concentration skills; to encourage the group to think imaginatively about sound. A screen – nothing elaborate. A pile of books on the front of a desk will suffice. A selection of articles such as paper, scissors, woodworking tools, bottles – plastic and glass, thick cellophane, cutlery, a pair of leather gloves, bubblewrap, a 12" (30cm) ruler, a plastic box full of metal bottle tops, an aluminium drink can etc, etc. Basically anything you can get a noise from. The toys in those Christmas crackers have to be good for something. Two sheets of lined paper, one with the lines numbered. An able, literate and inventive volunteer to make the sounds. The volunteer hides behind the screen with the assembled 'noise generators' and the numbered sheet. Everyone else sits where they can't see the volunteer and the stuff. It might be good to have them sitting with their back to the screen. The volunteer makes a sound, using the items in front of them, and writes down what they did to create it against number one on their piece of paper. Now everyone else tries to guess how the sound was made. Record all the suggestions against the number one on your piece of paper. Teenagers and adults will find it easy to guess many, if not most, of the sounds. Here the game is to think of as many plausible causes of the sound as you can before identifying the true source. Encourage outrageous flights of fancy. Once you have exhausted the first sound the volunteer makes another. Keep the sounds coming. Don’t let your group get bored. When you feel you've had enough, have the volunteer step out and tell you whether the guesses were right or wrong. Have them demonstrate some of the more interesting sounds in front of the other players. Now everyone can have a go at making the same sounds; and new ones too. I'd love to know how this went for you. 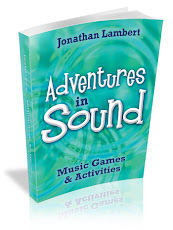 Oh, and I almost forgot to mention it, there are more games, like and unlike this one, in my book Adventures in Sound available from Amazon. Ah, the joys of self-employment! When there's no work I should be resting, basking in the warm glow of past success and spending my well-earned fees. Instead I'm mooching around, fretting that I'll never get any work again and seriously considering applying for unsuitable employment, positions I mean here, that would drive me insane. So when the offers finally come in I want to say yes to everything in case nothing else ever comes. I overload and get stressed by impossible and incompatible commitments and deadlines. But this is the kind of stress I love. Just at the moment there is very little happening besides my regular woodwind teaching and occasional gigs. But suddenly I have had a variety of offers of work after Christmas, all of it exciting. Would I play clarinet and tenor sax in a production of The Threepenny Opera? Well of course. Am I interested in helping primary school children explore their concerns around death, pollution and the environment through sound? Yes, absolutely. Would I like to work with a performance poet on a project aiming to improve listening and communication skills in eight year olds, taking food as a theme? Count me in. And the icing on the cake: write some music for a video about heroes and villains. What fun! Of course another thing about being a self-employed artist is that things rarely happen on the timescale that's been given at the outset and sometimes they never happen at all. Apart from 'Threepenny' these are all to be confirmed, but it's very exciting all the same and what fate can't take away is that I've been asked. And that's enormously flattering. The projects involving schoolchildren will both require them to develop their listening skills and become sensitive and discerning with regard to sound. My years spent teaching woodwind have shown me that it is only when students learn to hear themselves that they become musicians whose playing might please others. This faculty arrives at different ages in different people. Like self-awareness generally it can be encouraged and facilitated but can't really be taught. This month's featured game, Copycat, is ideal for developing listening skills, especially in children, and has applications far beyond the teaching of music. Try it; it's free and without obligation. You will find that many other games in Adventures in Sound add value in a far wider context. We could all be better at listening - to ourselves and to others. I am no Luddite and the fact that you are reading this on your computer, along with the fact that my book is available on line as a download, hopefully assures you of this. However, and you can probably feel a plug for said book coming, there is something wonderful about meeting people face to face and engaging with them in some artistic pursuit. And so, finally, to Adventures in Sound. This is a book that can make use of technology if you like. It can be read in electric light or use factory-made instruments. But it requires neither. The games and activities are not culturally specific and can work anywhere. OK, I admit the facilitator needs a working knowledge of the English language but beyond that… Download the taster and let me know what you think. I can guarantee some real and meaningful interaction with your fellows. And a lot of fun.